From HOW TO LIVE LONGER AND FEEL BETTER, 1986 Linus Pauling first came to the notice of many of his countrymen outside of science when he framed the issue on which public opinion compelled, at last, the suspension by the United States, the Soviet Union, and the United Kingdom of the testing of nuclear weapons in the atmosphere. From the time the atomic bomb tests began in earnest on Frenchman's Flats near Las Vegas, Nevada, in 1951, the Atomic Energy Commission regularly issued reassuring press releases. High energy radiation had caused no abnormal number of defects in the off-spring of parents exposed at Hiroshima and Nagasaki, they said. Generations of fruit flies raised in radioactive containers showed "more vigor, hardiness, resistance to disease, better reproductive capacity." It was Linus Pauling, speaking with the authority of a Nobel laureate (in chemistry, 1954), who exposed the fraud of this government's public relations campaign. He translated the physics of nuclear explosions into words and numbers people could understand. Thus, it was known that the neutron flux in an explosion transmutes atmospheric nitrogen into radioactive carbon-14. The Atomic Energy Commission called upon another Nobel Prize-winner, Willard Libby, to show this effect would have negligible consequences. The large molecules of the living cell are constructed around carbon, however, and C-14 readily substitutes for the non radioactive isotope C-12. From Libby's own figures Pauling calculated that the output of C-14 from the then scheduled weapons tests would cause 55,000 children to be born with gross physical and mental defects, result in more than 500,000 miscarriages, still births, and newborn deaths, and cause as much leukemia and bone cancer as that caused by all the fission products from the explosions combined. The public controversy, sustained by Pauling's robust contributions, eventually induced the superpowers to suspend the testing of atomic bombs in the atmosphere; they signed the treaty in 1963, and it went into effect on the very day of the bestowal of the Nobel Peace Prize for 1962 on Linus Pauling. Throughout his campaign against the weapon tests in the polarized American political climate of the 1950s, Pauling had to endure the impugning of his citizenship and even the official affront of the lifting of his passport for a time by the Department of State. As late as 1963, his Nobel Peace Prise was headlined in Life magazine as a "Weird Insult from Norway." Controversy was not, however, a novel experience for Pauling. In the first of his seminal contributions to science in the 1920s, he had brought quantum physics and his powerful visual imagination into chemistry. The chemical formula, laid flat in two dimensions on the page, then began to find operational expression in the architectural configuration of molecules and crystals in three-dimensional space. Pauling showed how to reconstruct these configurations from measurement of the distances and angles of the chemical bonds holding atoms together. Workaday chemists, content with their science in its pre-Pauling cookbook stage, attempted to repel the intrusion of physics into their field. They not only resisted his conceptual argument and challenged his data, but called his integrity into question. Two generations of chemists, raised since then on textbooks, including Pauling's own, that incorporate the revolution he brought to the foundations of chemistry, would have difficulty recognizing the ground of that forgotten controversy. The Pauling method in controversy has always been to establish the data and, in serene good humor, to state plainly what the data mean. He almost invariably turns out to be right on the data and rarely wrong on the larger meaning. In 1964 he was provoked, however, to bring suit against a particularly offensive newspaper. The jury, badly instructed on the law of libel, found that the newspaper could not injure the reputation of so eminent a man. For the past dozen years, Pauling's contributions to better understanding of nutrition and the enhancement of people's health-which he has set out in this book [HOW TO LIVE LONGER AND FEEL BETTER, 1986] have embroiled him in controversy with organized medicine and associated old-fashioned nutritionists. The physicians, with only a few distinguished exceptions, denounce this non physician's intrusion into the practice of medicine. They tend to pitch their argument on ad hominem grounds: Pauling is not a doctor, they say, but a superannuated scientist out of his depth. This controversy has been a somewhat lonely one for Pauling. People who acknowledge his stature in science deplore his travel so far out of the "mainstream." There are nonetheless many also who hold, with the late Rene Dubos, that the mainstream converges with Pauling twenty years later. 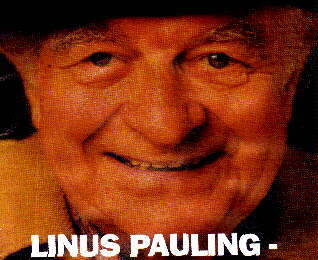 Linus Carl Pauling was born in Portland, Oregon, on February 28, 1901. the son of Herman William Pauling, a pharmacist, and Lucy Isabelle (Darling). He graduated from Oregon Agriculture College (now Oregon State University) with a B.S. in chemical engineering in 1922 and went to California Institute of Technology in Pasadena, where Arthur A. Noyes, Richard C. Tolman. and Roscoe G. Dickinson helped to shape his career. Joined by his bride Ava Helen Miller after a year, he pursued his studies in chemistry, physics, and mathematics, leading to a Ph.D. in 1925. Distinguished already by his appointment as a National Research Fellow, Pauling was awarded a Guggenheim Fellowship for study in Europe. He spent most of his year and a half at Arnold Sommerfeld's Institute for Theoretical Physics in Munich, but he also spent a month at Niels Bohr's Institute in Copenhagen and a few months in Zurich, where he studied with Erwin Schrodinger. He returned to California in 1927 and began his long career as a teacher and researcher at Caltech. Pauling was one of the first American chemists to master the technology of X-ray diffraction. This is the tool with which the distances and angles of the atomic bonds in the three-dimensional structure of crystals and molecules air determined; it is the tool that primarily brought on the revolution in the life sciences that we call today molecular biology. Much of Pauling's early research was on the X-ray diffraction of inorganic crystals, for example, topaz, the micas, the silicates, and the sulfides. His development of the coordination theory for complex substances helped to create the field of crystal chemistry. This theory guides the selection, from many possible crystal structures, of the chemically reasonable arrangement. It helped to bring X-ray diffraction into analysis of the structure of organic molecules. At Caltech Pauling also trained many of America's future X-ray crystallographers, among them, Nobel Prize winner W. N. Lipscomb. In 1930, as a result of a meeting with Herman Mark in Germany, Pauling became interested in electron diffraction and he used this powerful tool along with X-ray diffraction in his determinations of the structure of the large molecules of life. As X-ray analysis and electron diffraction gave him experimental tools for exploring the structure of molecules, so his study of quantum mechanics provided him with a theoretical tool. With this battery of tools he helped to bring about the reconstruction of the foundations of the science of chemistry. Of the new chemistry, that sees the bonds between and among the atoms of a molecule as established by the action of electrons, Pauling was the principal organizer, generalizer, and system-builder. His great work, The Nature of the Chemical Bond, is a landmark in the history of science. Pauling's interest in biological molecules was stimulated, as he recalls in this book, by the arrival of T. H. Morgan at Caltech in the late 1920s. By the middle 1930s Pauling was studying the hemoglobin molecule, a by its striking color and the vital function served by its property of combining reversibly with the oxygen molecule, Interest in hemoglobin led naturally to a more general interest in proteins. With Alfred Mirsky he published a paper on the general theory of protein structure, which suggested that the polypeptide chain of each protein is coiled and folded into a specific configuration which accounts for that molecule's function in the body; the molecule lose this function, is "denatured," when that configuration is lost by breakage of the chemical bonds that coil and fold the molecule. On one of Pauling's visits to the Rockefeller Institute in New York, he met Karl Landsteiner, the discoverer of blood types, who introduced to the field of immunology. Pauling's first paper on the structure of antibodies first appeared in 1940. During World War II the thrust of his work shifted somewhat toward practical problems, for example, finding an artificial substitute for blood serum. For his work in the service of the wartime Office of Scientific Research and Development, he was awarded the Presidential Medal for Merit. At the end of the war, as a result of an encounter with Dr. William D. Castle, a coworker on a committee of the Bush Report, Science, the Endless Frontier. Pauling became interested in sickle-cell anemia, which, he speculated might be a molecular disease caused by an abnormal hemoglobin molecule. Working with Harvey Itano and others, Pauling showed in 1949 that the abnormal hemoglobin was caused by just a single amino acid anomaly in one of the polypeptide chains. While a guest professor at Oxford University in 1948, Pauling returned to a problem that had occupied him in the late 1930s, the coiling of polypeptide chain in proteins. By folding a paper on which he had drawn a polypetide chain, he discovered the alpha helix. Pauling and Robert B Corey published a description of the helical structure of proteins in 1950, and structure was soon verified experimentally. With the recognition that deoxyribonucleic acid (DNA) is the genetic molecule, Pauling became interested in its three dimensional structure. In 1953 he and Corey proposed that it was made up of three chains, twisted around each other in ropelike stands. Shortly thereafter, Watson and Crick proposed the double helix structure, which turned out to be correct. Watson and Crick had the advantage of X-ray photographs of DNA taken by Rosalind Franklin, an advantage denied Pauling because the U.S. State Department had lifted his passport (which it reissued when he received the 1954 Nobel Prize in chemistry). With the increased public visibility bestowed on him by his Nobel Prize, Pauling began to devote more of his attention to humanitarian issues connected with science. In 1958, Pauling and his wife presented a petition signed by over eleven thousand scientists from around the world to Dag Hammarskjold, secretary-general of the United Nations, calling for an end to nuclear-weapon testing. He had to defend that petition before a congressional subcommittee in 1960, and he even risked going to jail for refusing to turn over the correspondence with those who helped to circulate his petition. Meanwhile he had published his book No More War! Through the middle sixties Pauling was at the Center for the Study of Democratic Institutions in Santa Barbara, California. He had left Caltech largely because of institutional hostility there to his peace efforts; at Santa Barbara he hoped to be able to work in both areas, science and peace. Then be turned to work on the structure of the atomic nucleus, from which he proposed his close-packed spheron theory that sees the protons and neutrons in the nucleus arranged in clusters. The theory provides a simple explanation of nuclear properties, including asymmetric fission. Pauling left Santa Barbara in 1967 to become research professor of chemistry at the University of California in San Diego. There he worked on the molecular basis of memory and published, in 1969, his paper on orthomolecular psychiatry. This interest in orthomolecular medicine continued throughout the period of his professorship at Stanford University in the late 1960s and early 1970s and led to his founding, in 1973, of the Linus Pauling Institute of Science and Medicine. Throughout this latter phase of his career, Pauling's interest has centered on nutrition and the role of the micronutrients, especially vitamin C (ascorbic acid), in the physiology of the organism. From this work came a book for the lay reader, Vitamin C and the Common Cold published in 1970, which received the Phi Beta Kappa Award as the best book on science of that year. Soon after, Pauling became interested in the use of ascorbic acid in the treatment of cancer, largely through his contact with the Scottish physician, Dr. Ewan Cameron. Their collaboration resulted in his 1979 book, Cancer and Vitamin C with Dr. Cameron as co-author. Now in his eighties , Pauling continues to travel all over the world, lecturing both on his classic work in chemistry, biology, medicine, and peace, and on his present amplification his earlier ideas. He also continues to write on these topics. In 1983, for example, the twenty-fifth anniversary revised edition of No More War! was published. In all this he has remained faithful to his structural vision, whether he is using it to understand the world of matter or to help improve the world of man. In the latter 1980s Pauling began his collaboration with German doctor Matthias Rath, MD. Together, they discovered the vitamin C/lipoprotein(a) connection, proposed a unified theory to explain the great problem of cardiovascular disease, and in 1994 they were awarded two patents for inhibiting the binding of lipoprotein(a) plaque to the walls of arteries and tissues. Before he died in August 1994, Pauling asserted that he had come to believe that the proper use of vitamin C and lysine can completely control, even cure, cardiovascular disease, heart attacks and stroke. How to order the Prentice Hall book Linus Pauling in His Own Words Edited by Barbara Marinacci. Linus Pauling Institute Now at Oregon State University.